A couple of weekends ago, Jac and I visited the Southern Forests region, around 3.5 hours’ drive from Perth. Our visit was hosted by Genuinely Southern Forests and timed so we could catch the final weekend of Unearthed Pemberton, a festival showcasing the Southern Forests region through the themes of food and wine, art and heritage, and adventure, giving visitors the chance to experience a real taste of life in the Southern Forests region. 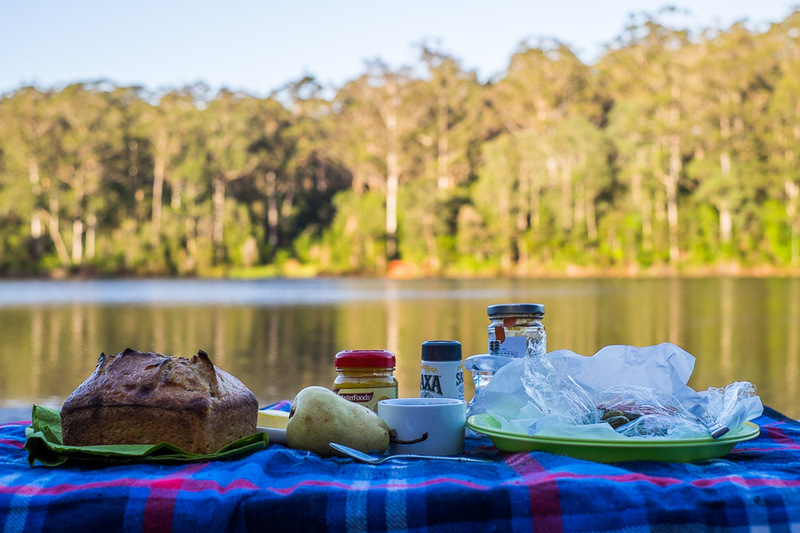 The Southern Forests region is one of Western Australia’s natural beauties and a fantastic food bowl, with over 50 different types of food and vegetables grown in the region. On this weekend, I learned that it produces 70% of Australia’s avocados (from October to mid-February), 90% of WA’s potatoes (from January to March); and 50% of WA’s apples. Pink Lady apples originated in the Southern Forest town of Manjimup, and of course, the region is famous for being black truffle country. 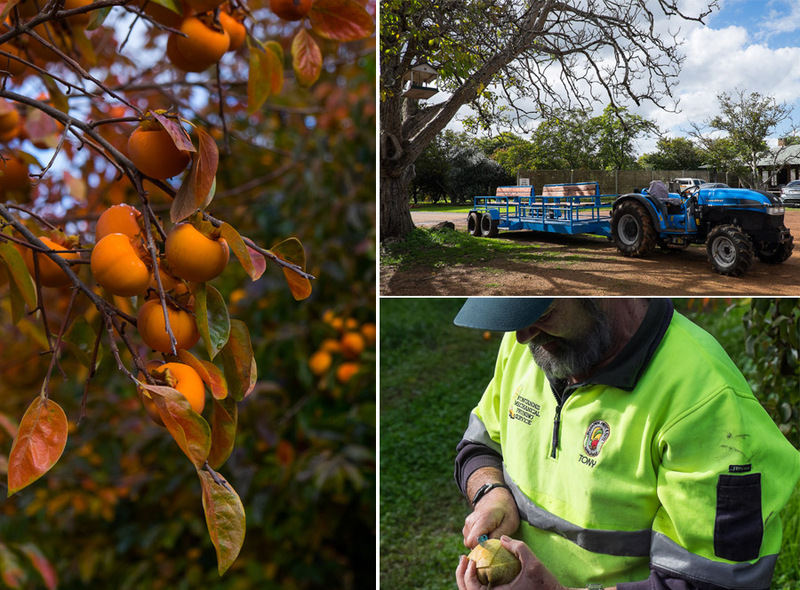 Our first stop was Fontanini’s Fruit and Nut Farm in Manjimup, where we toured the orchards and ate crisp Pink Lady apples picked right off the tree. 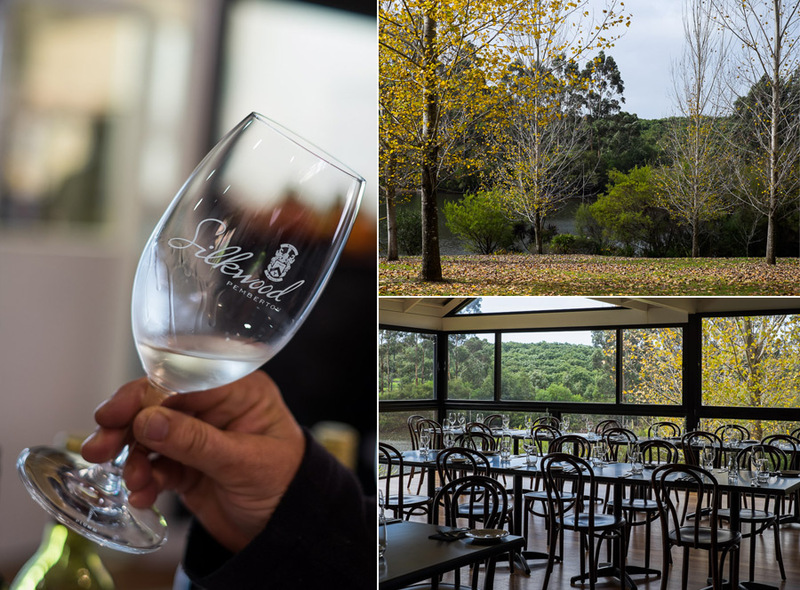 The Fontanini family has really made its mark in Manjimup – Archimedes Fontanini came to Manjimup from Tuscany way back in 1904, joined by his younger brother Germano. 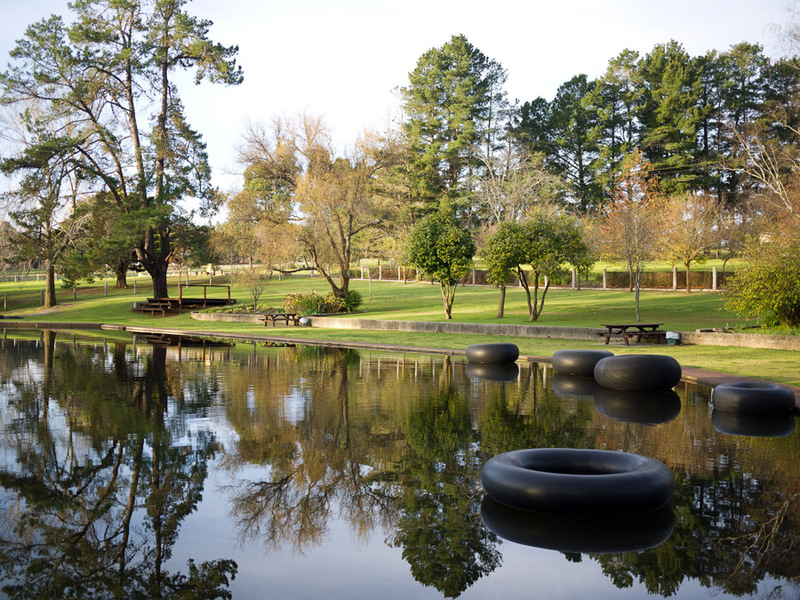 Archimedes created Fonty’s Pool, now a heritage-listed Manjimup icon, and Germano established the fruit farm next door. We enjoyed a bumpy but exhilarating ride in a cart attached to a tractor driven by our tour guide, third generation farm owner Tony Fontanini. He stopped every so often to tell us about the section of the orchard we were in, and to pluck fruit from trees for us to taste – pears, apples (Fuji, Pink Lady, Kanzi, Green Star), persimmons and feijoas. Waiting for us at the end of the tour, hot roasted chestnuts fresh off the fire, giving off an enticing aroma. Tony showed us how to rub the chestnuts between our fingers to work the scorched, smoky shells off to reveal the buttery nuts inside. Besides apples, pears, persimmons, feijoas and avocados, the Fontaninis grow chestnuts, walnuts, hazelnuts and macadamias on their 65-hectare farm. Visitors are welcome, and when the fruit and nuts are in season, you can buy them at very good prices from the stall right next to the packing shed, or even better, pick your own from the orchard. 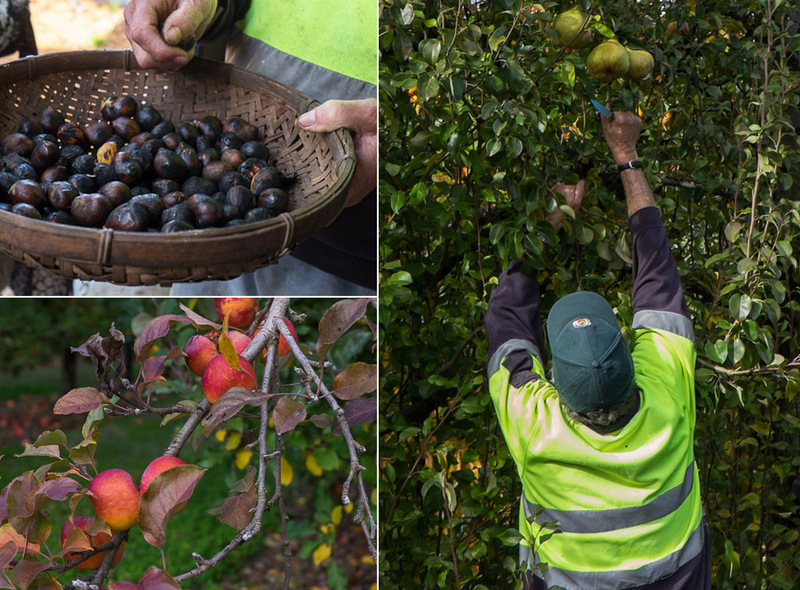 The Fontanini Fruit and Nut Farm tour was an Unearthed Pemberton event (adults $5, children free). Left: persimmons on the tree. Top right: Our tour vehicle. Bottom right: Tony Fontanini slicing up a pear. Top left: Hot roasted chestnuts. Bottom left: Fuji apples on the tree. Right: Tony picks us a ripe pear. Western Australia’s famous freshwater crayfish, marron are endemic to the south west between Harvey and Albany, with most of our state’s marron production coming out of the Southern Forests region. 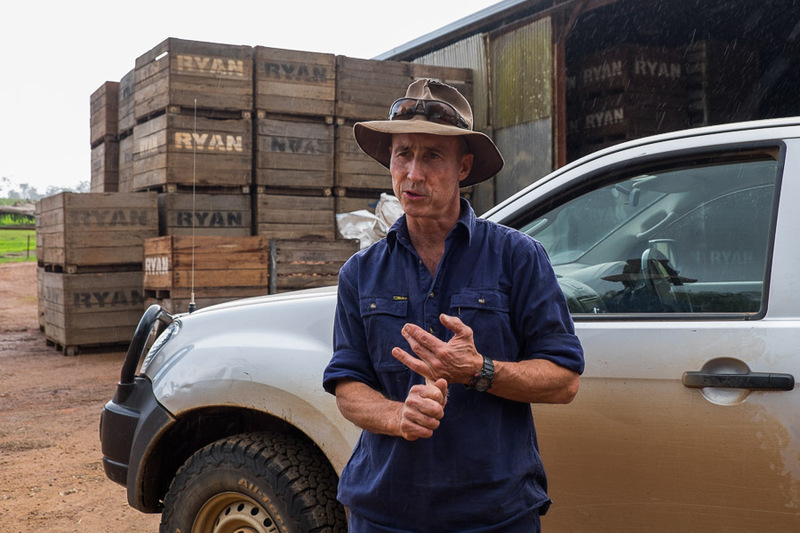 We visited Forest Fresh Marron and met Dave Evans the ‘Marron Baron’. Forest Fresh’s marron have been farmed sustainably either in local ponds or dams and are graded by weight starting from 130 grams up to 500 grams plus. They are sold live, their freshness guaranteed, and delivered throughout Western Australia and to the eastern states. Dave doesn’t just do commercial sales; if you’re holidaying in the region and self-catering, you are welcome to drop by to purchase marron. And if you need a vessel to cook it in, Dave will even loan you a pot. 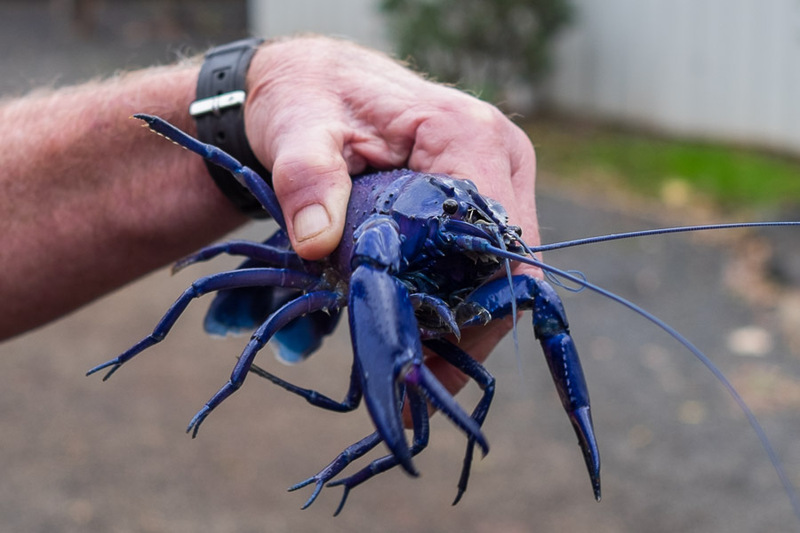 Most of Dave’s marron had black shells but a number were vibrant blue. There’s no discernible taste difference though; black or blue, the shells all turn bright crimson when cooked. Despite this, blue marron still cost more than the black ones, and are often bought for aquariums rather than the table. The ‘Meet a Marron, Tickle a Trout’ tour was a free Unearthed Pemberton event. On a related note, there are two species of marron – hairy marron, which are only found in the upper reaches of the Margaret River and are listed as critically endangered; and smooth marron, which are found in most dams and rivers in the south west, farmed in aquaculture and are the ones we eat – the smooth marron are generally what most people are thinking of when they say ‘marron’. Our tour of the family owned and run Ryan Potato Farm was led by farmer Glen Ryan. 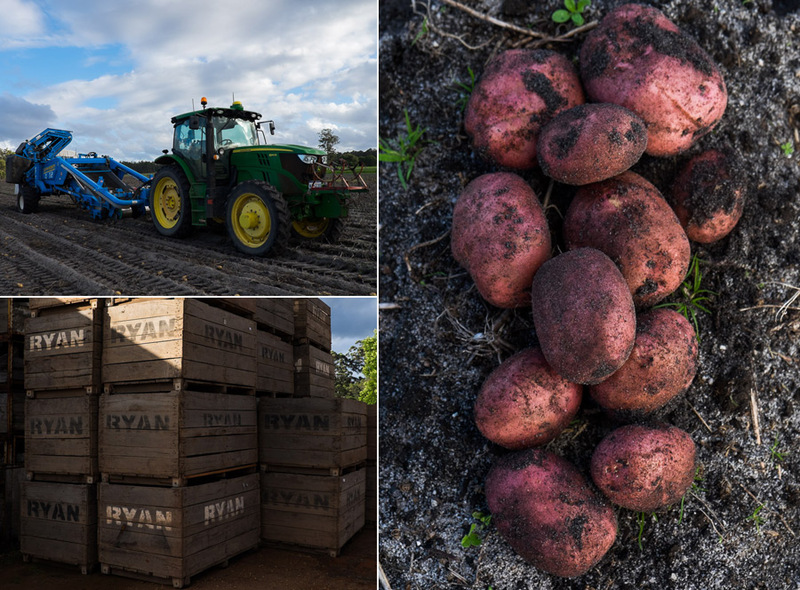 We learned how potatoes are grown and how the Ryans actively work to improve and nurture the health of their soils and the structure of their land, rotating crops and cows (they also farm beef) through their paddocks. We drove out to a potato field to check out the harvester and had fun dodging sloppy fresh cow poo on the way. Last was a visit to the packing shed where the spuds are washed, graded and packed for transport. 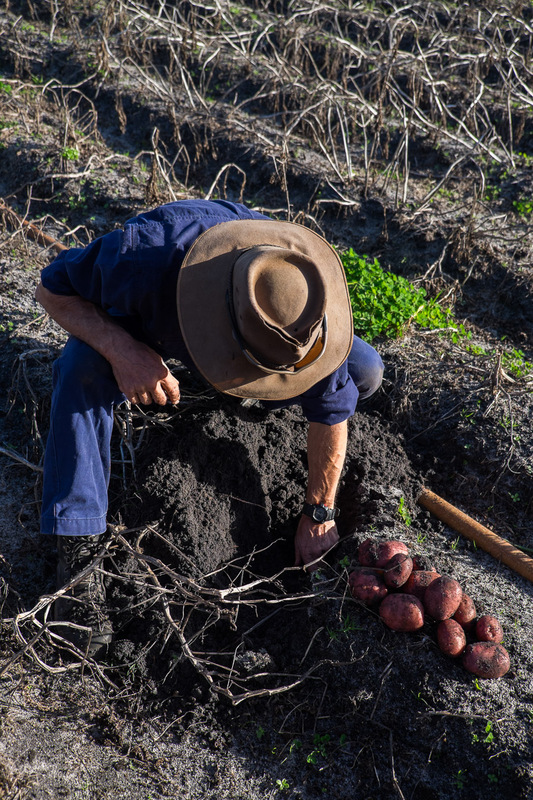 The Ryans have been growing potatoes for over 50 years and now provide to the market all year round; the farm we visited in Pemberton grows potatoes during the summer months, complemented by the Ryans’ farm in Dandaragan (north of Perth), which grows potatoes through the winter months. Farm tours provide a valuable opportunity to gain an insight into the work that goes into our produce and to gain an appreciation for the people whose efforts and commitment ensure we have good food to eat. If you get the chance to go on a farm tour, I highly recommend it. The Ryan Family Potato Tour was a free Unearthed Pemberton event. Out in the field, Glen dug up a batch of Laura potatoes for us. 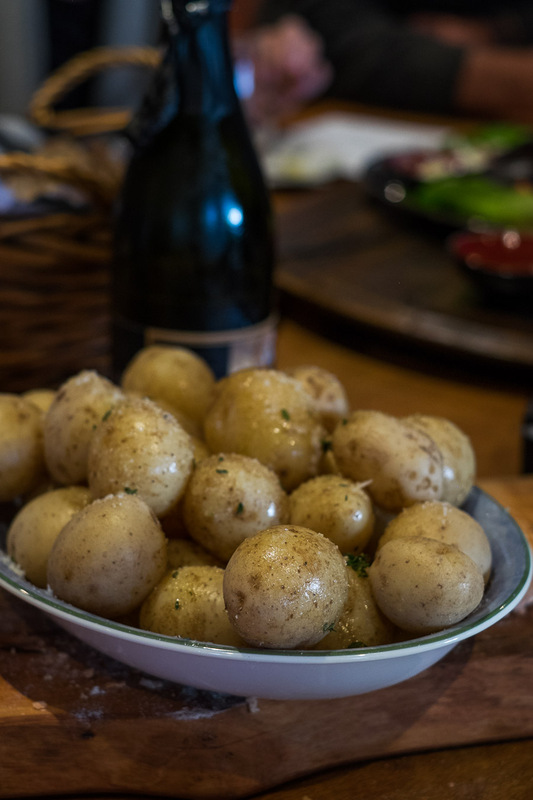 Lauras are good for mashing, baking and chipping – Jac made a fantastic potato bake with them for dinner at home. We stayed at Foragers, 6 km from Pemberton town. Our studio was called ‘Chestnut’ and was remarkably spacious for a studio. The accommodation – the open plan studios (designed for 1-2 people), two-bedroom chalets (for up to 4 people) and farmhouse (up to 6 people) – are spaced well apart, giving a sense of privacy. 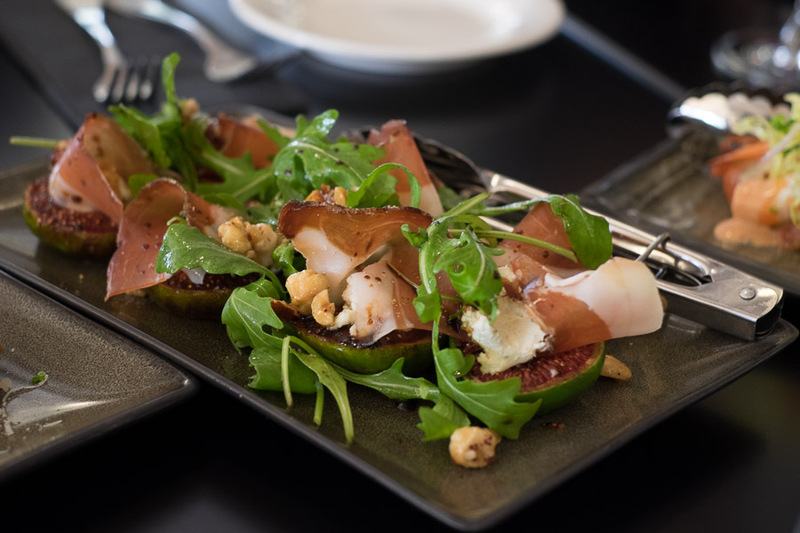 The place is run by chef Sophie Zalokar and her husband Chris, who moved from Fremantle to Pemberton with their two children in 2005. They launched Foragers in 2011. 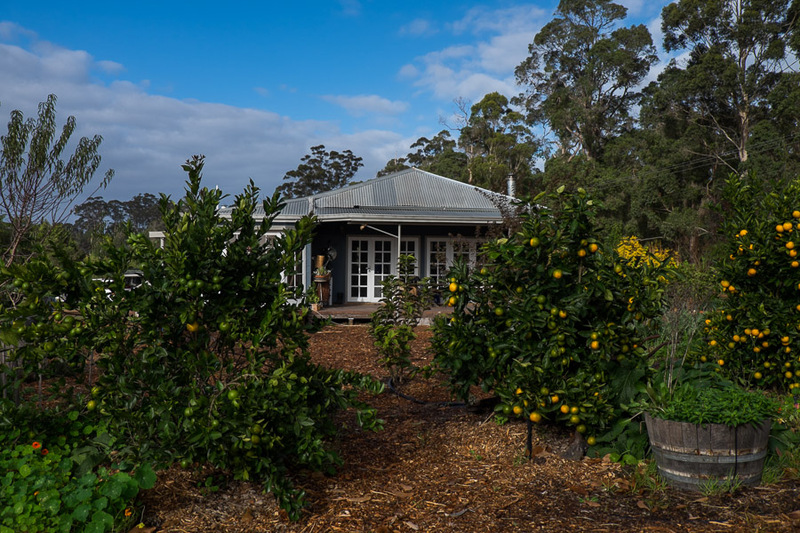 Guests come here for more than the self-contained luxury accommodation; they come for a Southern Forests culinary experience, attending Sophie’s classes at the Foragers Cooking School and the weekly seasonal dinners in the Field Kitchen restaurant. 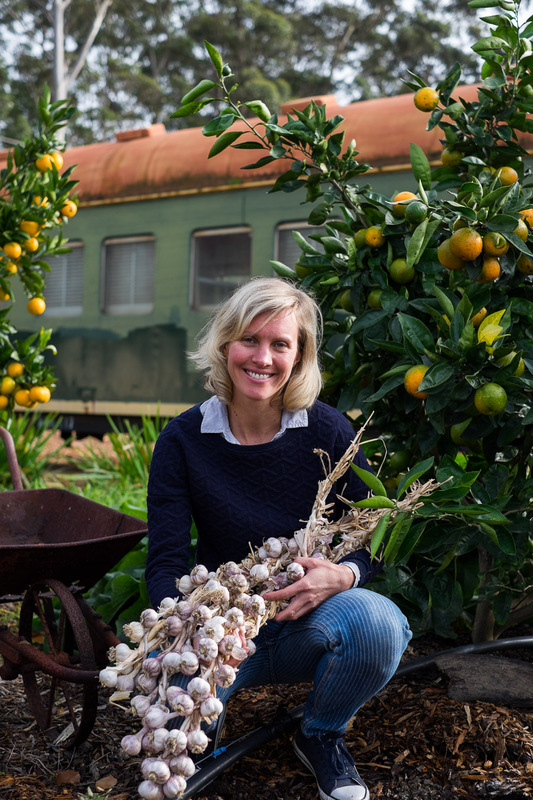 Sophie was born and raised in the Barossa Valley in South Australia and trained under Maggie Beer. Chris, originally from Switzerland, has a background in cabinetmaking and carpentry; he built the chalets, studios and Field Kitchen. Over the years, they have reared rare breed pigs, chickens and ducks, established a heirloom kitchen garden and heritage fruit orchard. 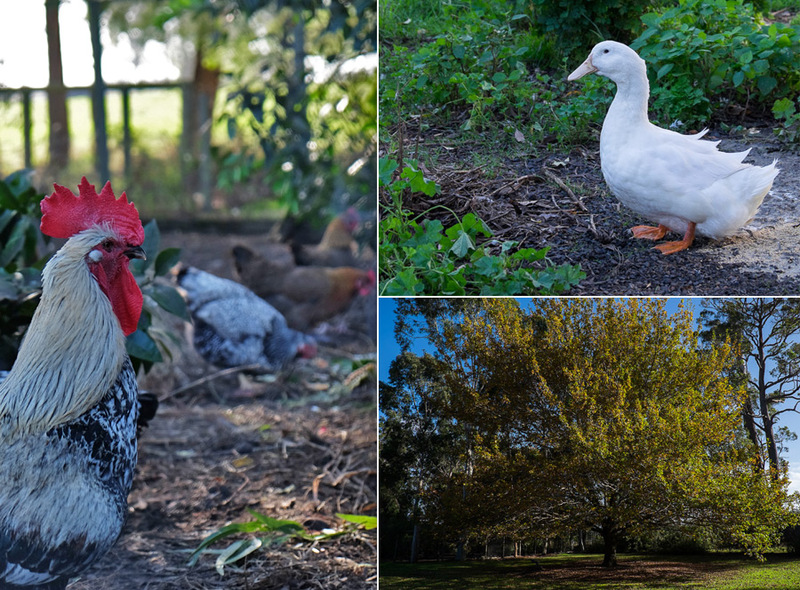 They don’t have any pigs at present, but we met the chooks and two downy ducks during our stay. It was pouring with rain when we arrived just before sunset on Saturday. We couldn’t wait to kick off our muddy boots, get comfortable and relax for a couple of hours before dinner. We got the wood fire crackling in just a few minutes, and then Chris Zalokar appeared at our doorstep with our continental breakfast hamper (complimentary for your first morning) – with a loaf of crusty home-baked bread that smelled so incredible I wanted to eat some right away, a block of butter, a dish of homemade strawberry jam, freshly ground Fiori coffee, Bannister Downs full cream milk and two bottles of local sparkling apple juice. Just before 7pm, we followed the path to the Field Kitchen for the evening’s seasonal dinner. 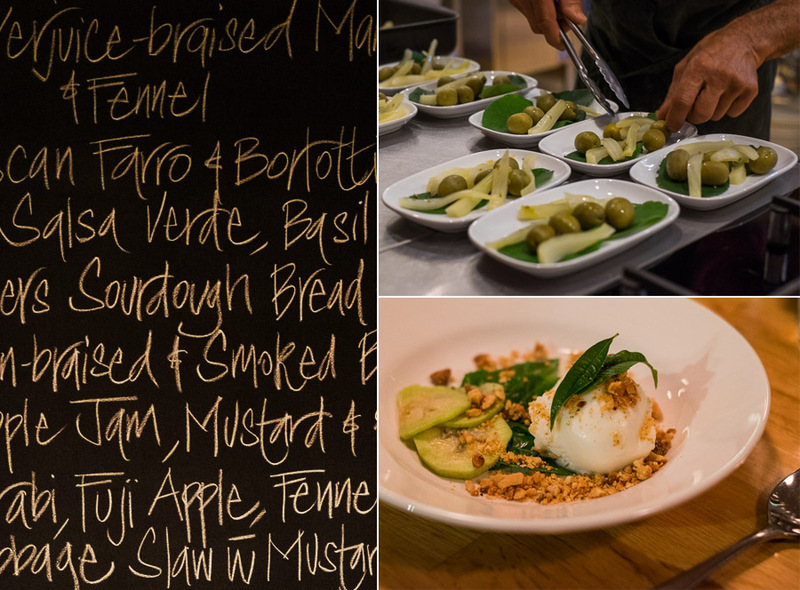 Foragers’ seasonal dinners are held on Saturdays; the menu is designed each week, depending on what’s fresh and in season, wherever possible using local and Western Australian produce. The week’s menu is published online at Foragers’ website and guests are encouraged to bring along a bottle of wine to enjoy with their meal. Dinner is served long-table style. It was a full house, around 50 diners. After the main course, Sophie came out from the kitchen to tell us about our meal. The rustic Tuscan farro and bean soup topped with salsa verde featured borlotti beans grown in Manjimup. The Harvey Beef brisket, cooked in a slow oven for nine hours and then hickory-smoked, was served with mustard and a sweet apple jam made with cloves, all spice, Gala apples from Newton Orchards in Manjimup, local apple cider vinegar and a just touch of chilli. The crunchy winter coleslaw served with the brisket comprised kohlrabi, fennel, radicchio and Chinese cabbage from Newy’s Vegie Patch in Kirup, and Fuji apples from Phil’s Vegie Patch in Northcliffe. The sourdough bread was made from Sophie’s own sourdough starter and as I spread butter on a slice, I relished the thought of that crusty loaf in our hamper waiting back at our studio. Our dessert had been made with syrup of Tahitian limes from Pemberton Lime Co, infused with lemon verbena and churned with yoghurt, served with toasted macadamias from MacNuts in Baldivis and feijoas from Fontanini’s Fruit and Nut Farm. Coffee and tea were available, but we were happy to get back to our studio and curl up in bed with cuppas. But here’s the bad news – after realising their long-held dream of running a successful culinary tourism business and seeing their kids through childhood in the country, the Zalokars are looking to explore new avenues and have put Foragers on the market. Until the place is sold, it is business as usual, so if you are keen to experience Foragers (and I think, the best of Pemberton), you’d better get there quick. 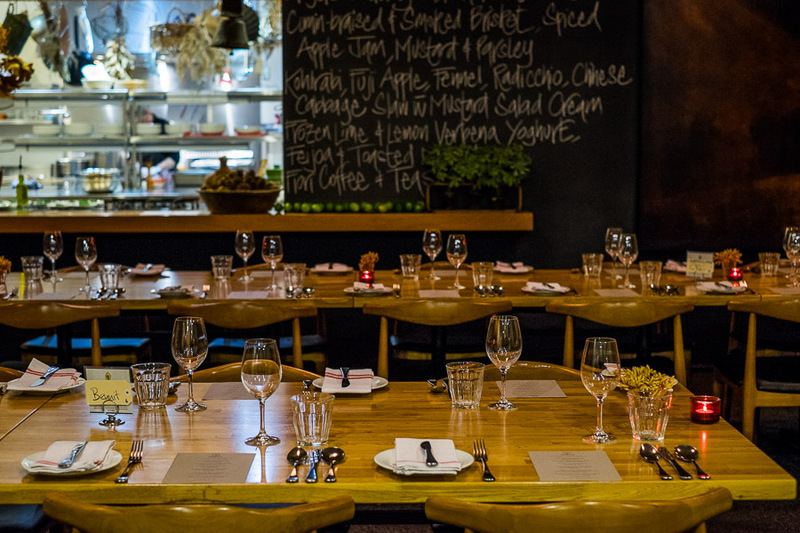 Seasonal dinners are on Saturday nights, $80 per person, BYO – bookings are essential. See the Foragers events calendar. The studios are $250 per night during non-holiday periods, $270 per night during holiday periods. Includes a complimentary breakfast hamper for your first morning. 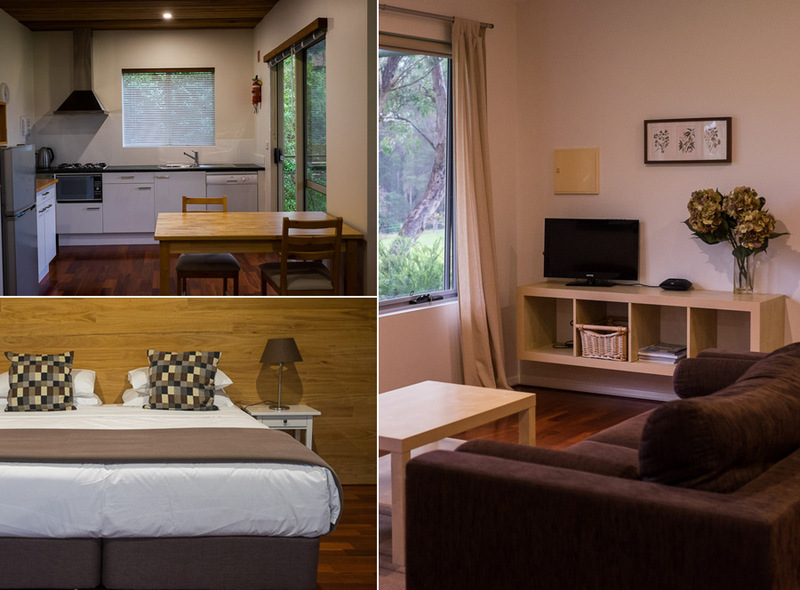 See more info about the different accommodation available at Foragers. There’s no wifi available and practically no mobile coverage in the accommodation (I could sometimes get a weak signal in the carport, but none inside the studio). I was able to get mobile signal in the Field Kitchen, and of course, in Pemberton and Manjimup town. Manjimup is around half an hour’s drive away. Each studio/chalet has its own undercover parking, with firewood stacked next to the front door. Our studio was well appointed with TV/DVD player, slow combustion wood fire and reserve cycle air-conditioner/heater, king-sized bed, electric blankets, and a fully equipped kitchen including dishwasher, stove-top, microwave, fridge, toaster, kettle, coffee machine (for the Fiori coffee), crockery and cutlery, pots and pans and cooking tools. There’s a veranda out the back, with a barbecue. This was the view from our veranda. We woke up early on Sunday morning, made cups of tea, packed a picnic breakfast and drove out to Big Brook Dam. The dam was built in 1986 to supplement the water supply to Pemberton town and local trout hatchery. A magpie boldly stalked us, edging ever closer while we laid out our loaf of Foragers sourdough bread, butter and homemade strawberry jam, a ripe pear and banana, honey leg ham and pickles, mustard and chutney. Even though we’d rugged up, it was pretty chilly! But it’s such a lovely, tranquil place and the crisp air was invigorating. 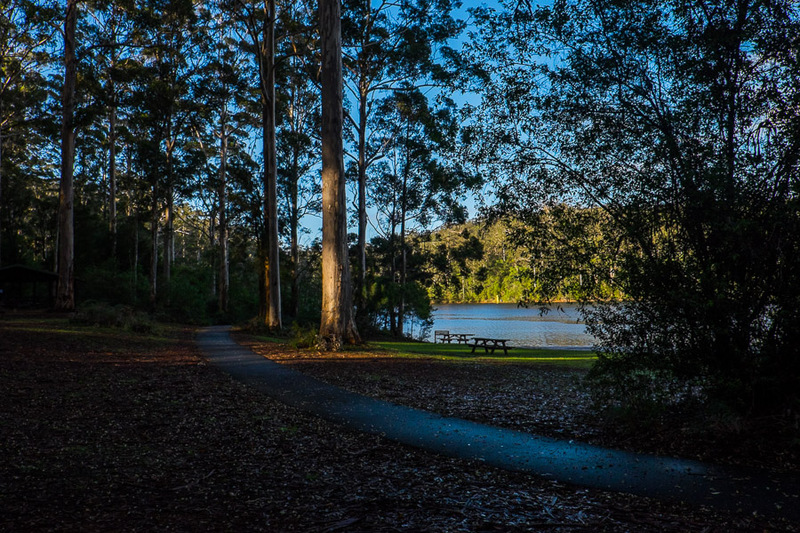 There are picnic benches, barbecue facilities and toilets at Big Brook Dam. At the sandy section called ‘the beach’, you can launch a kayak. Note: you’ll need to transport your kayak approximately 100 metres from the car park down a winding path – a trolley (or a strong companion) is advisable. You can fish for trout and marron at Big Brook Dam (in accordance with Department of Fisheries rules). Next time we hope to walk the 4.2 km Big Brook Dam Walk Trail that loops all the way around the dam. Big Brook Dam and more specifically about the Big Brook Dam Walk Trail. Don’t rely on Google maps when driving down roads like these – do yourself a favour and get a paper map. We were picked up from Foragers at 11.15am on Sunday by our driver and guide Graeme Dearle of Pemberton Discovery Tours. Our Progressive Lunch included four Pemberton wineries; we tasted wines at all four and were very well fed at three. We were joined by two other couples for what turned out to be a relaxed and sociable day out. First stop, Silkwood Wines. After a few rounds of tasting, I bought a bottle of the dessert-style 2014 Silkwood Silk Viognier to take home, while Jac and one of our tour mates Liz decided to share a bottle of Silkwood Verdelho with lunch. We moved from cellar door to restaurant where a table was ready for us. The food was delicious: crumbed local snapper fillets with kohlrabi and finger lime; arancini made with chorizo paella; gourmet potatoes with shaved parmesan and truffle; figs with prosciutto, blue cheese whip and hazelnuts; Exmouth prawns with tomatoes, local avocados and Mary Rose sauce. Apart from the potatoes, there were seven of each item (Graeme joined us for food, but as designated driver he didn’t touch a single drop of alcohol the entire tour). Chef Kelly came out from the kitchen for a chat and asked how we liked our food – we showed her the empty plates. Top left: snapper fillets with kohlrabi and finger lime. 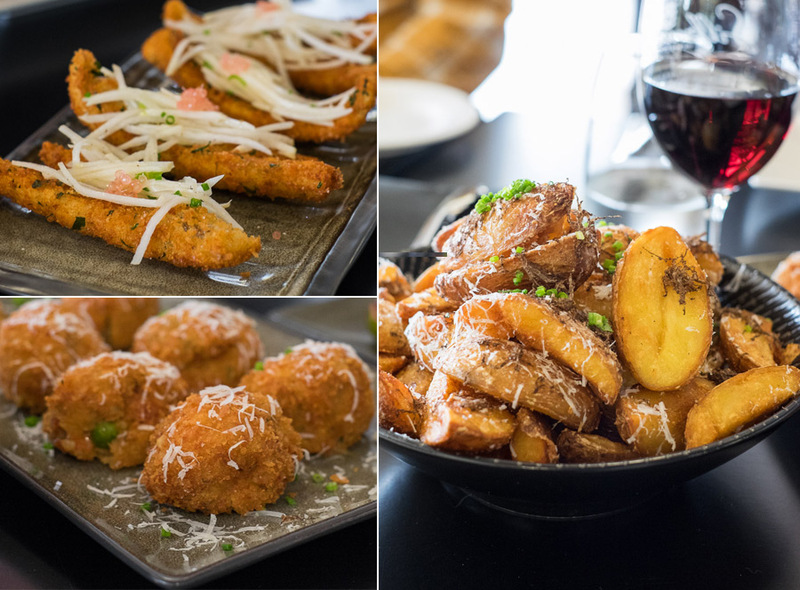 Bottom left: arancini with chorizo paella filing. Right: potatoes with parmesan and truffle. 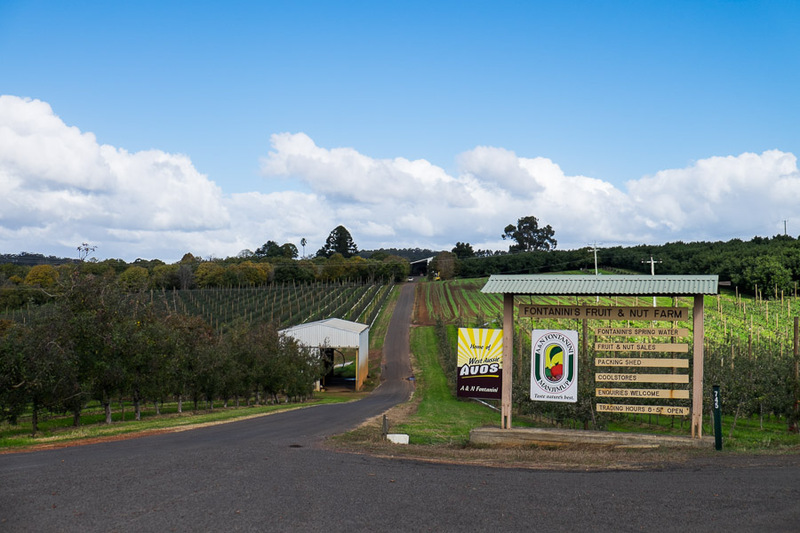 Established in 1987, Mountford Wines produces organic wine and cider. 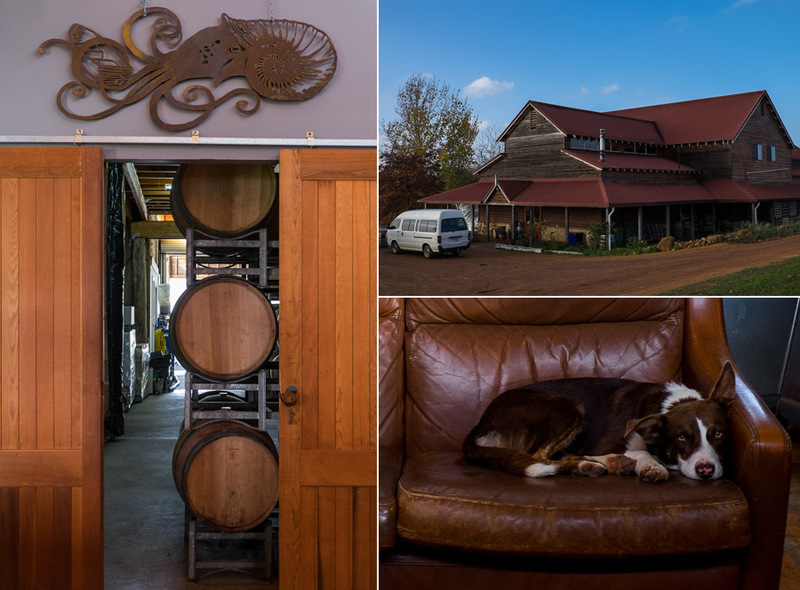 The Mountford vineyard is one of the oldest in the region, the site carefully chosen by owner and trained horticulturalist Andrew Mountford after searching for an undiscovered region of Australia – with the right combination of soil, climate and topography. Mountford’s cider is sold under the Tangletoe label; our Foragers continental breakfast hamper included two bottles of Tangletoe non-alcoholic soft cider, lightly carbonated and very refreshing. I tasted more cider than wine here: the sparkling, medium dry, and scrumpy – the medium dry with the sweet quality of apple was Jac’s and my favourite and we didn’t hesitate to buy a bottle. Top left: The cellar door is an art gallery as well, displaying works by local artists. 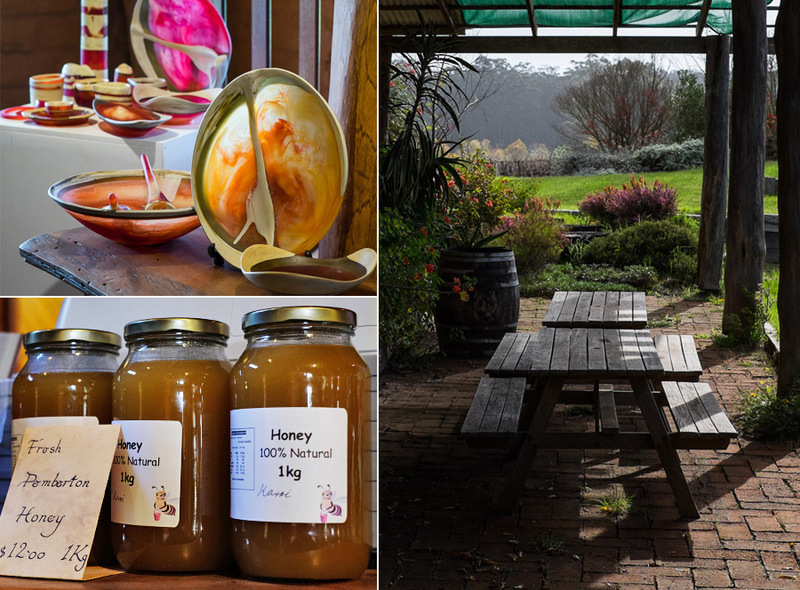 Bottom left: I must admit I was most excited about the 1 kg jar of Pemberton karri honey we bought from Mountford Wines for $12. At Lost Lake, owner and winemaker Ash Lewkowski gave us a behind-the-scenes taste of Sauvignon Blanc and Pinot Noir straight from the barrel, plus freshly pressed sweet Pink Lady apple juice, soon to be made into cider (we also got to try the cider, named Tickled Pink). Back at the cellar door, more tastings. Ash shared the story behind Lost Lake’s striking logo, before we moved to the deck and sat down to a magnificent platter featuring products by Pemberton’s own Holy Smoke – smoked chicken, smoked Portuguese chicken, hot smoked bourbon and maple salmon (my favourite), smoked chicken dip, Blackwood beef pastrami, fried chorizo, olives, local Pink Lady apple and grapes, a selection of chilli jams and chutney, and toasted Turkish bread with macadamia dukkah. Somewhere between my greedy bites of smoked chicken and salmon, I snuck a taste of Lost Lake Honey Merlot and had an instant ‘shut up and take my money’ moment! There’s no honey in this sweet, very fruity wine, which is designed to be served chilled. 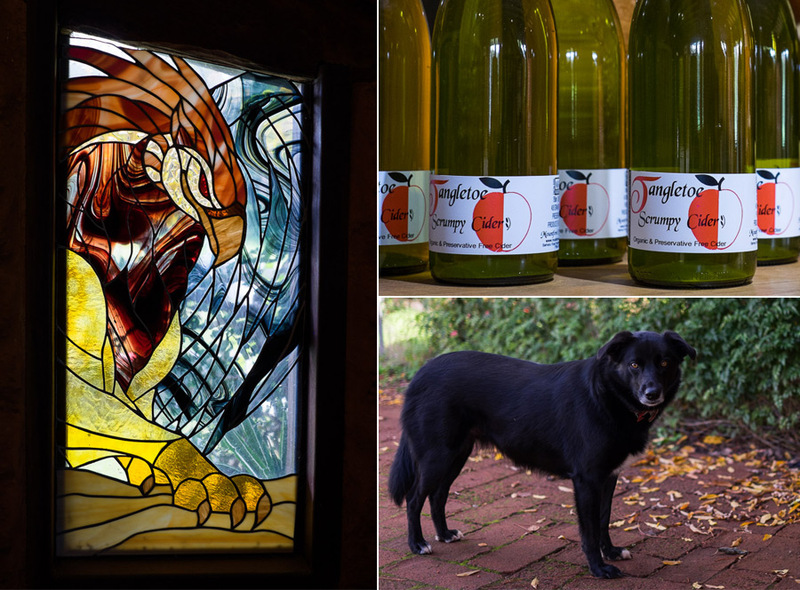 Besides the wines, there are local gourmet products and gifts for sale, interesting artwork and a couple of friendly winery dogs who adore chin and tummy rubs. I really enjoyed Lost Lake Winery and will certainly visit again. We were welcomed to Pemberley, our fourth and final stop, by owners Dave and Monica Radomiljac, who ensured we each had a glass of wine in hand before we stepped out to view the artworks on display for Sculpture in the Vines 2016, an Unearthed Pemberton event. 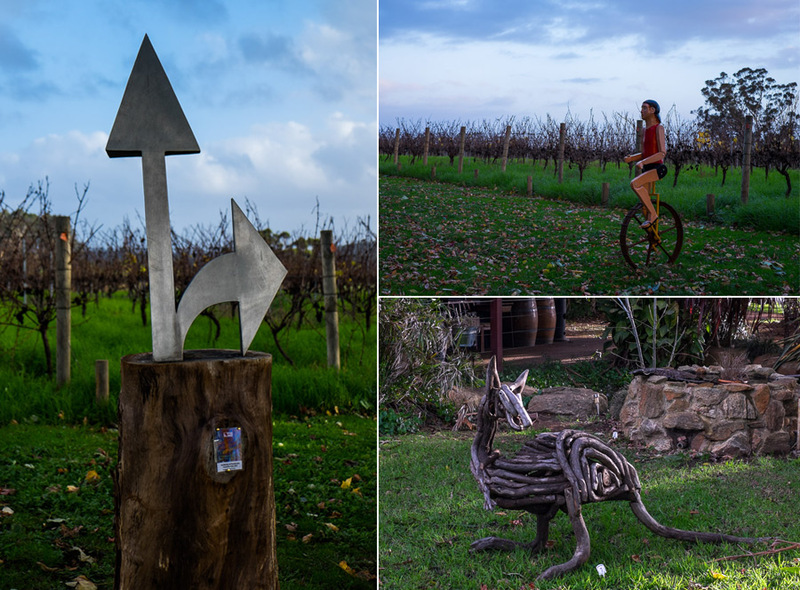 The vineyard provided a picturesque setting for the 20 or so sculptures, especially against the stunning autumn sunset. 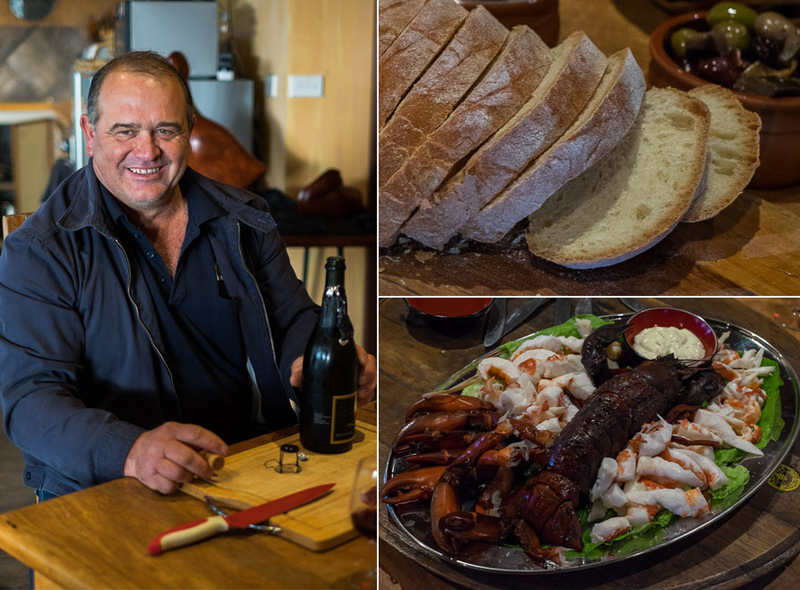 We then took our places around the big marri table where Dave, a farmer by background, sat slicing a homemade salami, urging us to dig into the platter of marron (caught from their own dam) and to help ourselves to the crusty home-baked truffled bread – true blue Southern Forests hospitality! But the best thing of all was the plate piled high with Pemberley Farm potatoes, simply spectacular with salt and lashings of butter. The sparkling ‘Lustre’ (a Chardonnay and Pinot Noir blend) was very well received around the table, as were the Moon Merlot and Pemberley Pinot Noir (we bought a bottle of the Pinot). 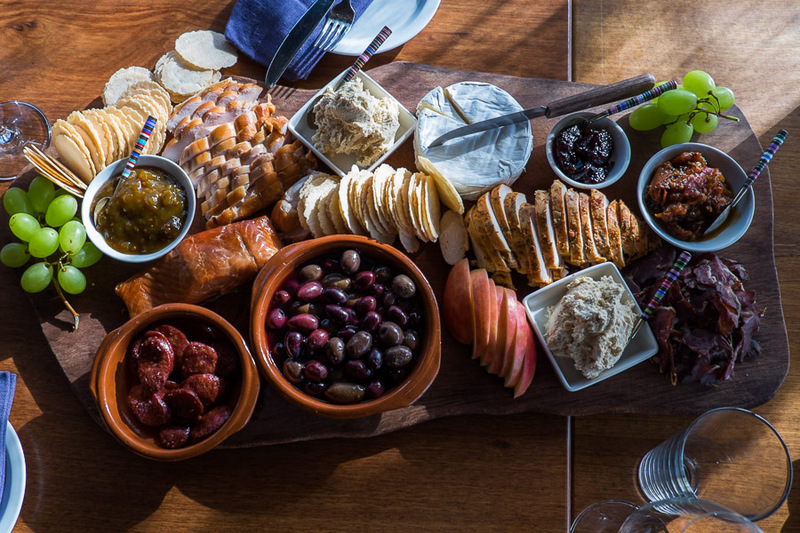 Pemberley showed us the most wonderful way to taste wine, sitting around the family table, with great food and conversation, and lots of laughter. It was a brilliant ending to a terrific day. Not surprisingly, after such a long lunch, we didn’t need dinner that night. 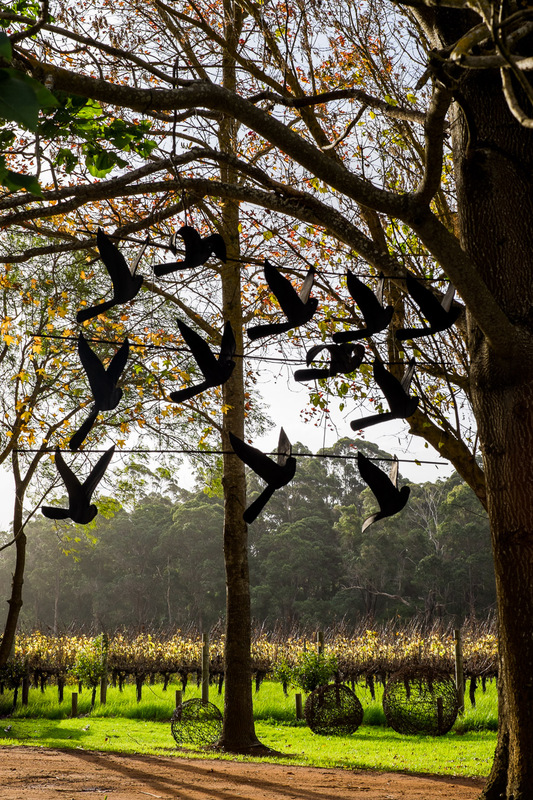 My favourite of the sculptures, Flight of Carnaby Cockatoos by Joanna Box, made from recycled tyres. In the background, Orbs by Joy Head. Left: Fork by Mark Grey-Smith (awarded the Pemberley of Pemberton Acquisitive Prize for 2016). Top right: Hudson by Joanna Box, bottom right: Kangaroo by Joanna Box. Heavenly hot potatoes with salt and melted butter. The Progressive Lunch was an Unearthed Pemberton event that cost $120 per person. Pemberton Discovery Tours have been running beach and forest eco adventure small group tours in Pemberton for 16 years. Their Pemberton wine discovery tours are a fairly recent addition but have proven very popular. 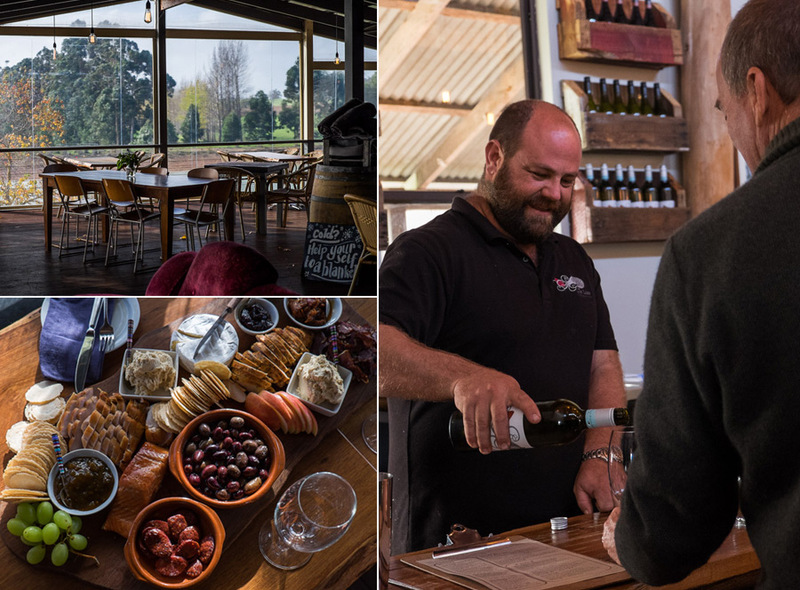 It’s an excellent way to visit a selection of Pemberton’s wineries as all your transport (to/from your accommodation and to/from the wineries) is covered, so you can enjoy yourself without worrying about drink driving. Pemberley’s cellar door is open by appointment, but Dave assured us you don’t need to be in a big group/tour bus. Sculpture in the Vines was on throughout the Unearthed Pemberton festival and free to attend. On Monday morning before heading back to Perth, we went to Stellar Violets to meet with its founder and manager Lucinda Giblett. Stellar Violets (named after Lucinda’s grandmothers) is an arts and cultural centre just outside of Manjimup town that aims to share and inspire healthy, sustainable living and help reconnect people with food provenance and the land. With various elements still under construction, Stellar Violets is a work in progress and not open to the public yet. 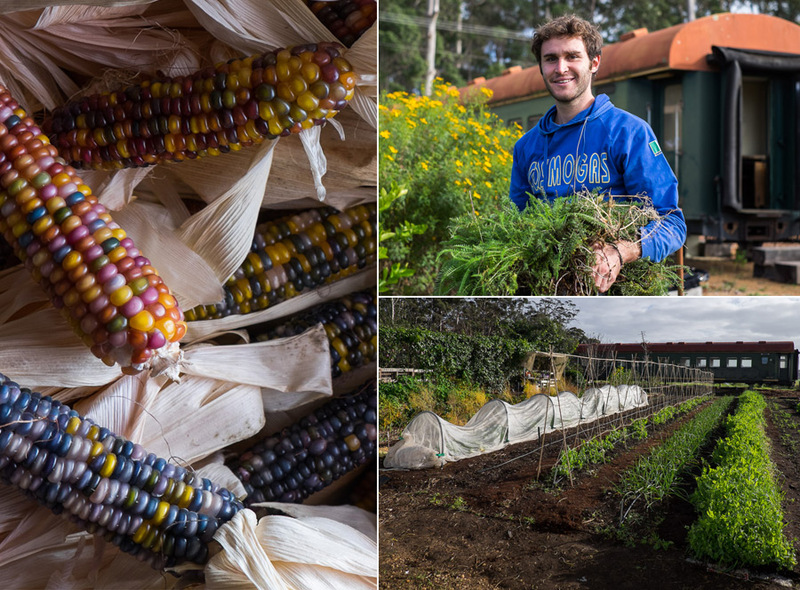 It will be an educational farm that (already) grows its own food, showing others how to do the same; Lucinda took us through the fruit, vegetable and herb gardens, planted using permaculture methods. There’s a mini organic market garden, with a macadamia nut orchard next to be established. 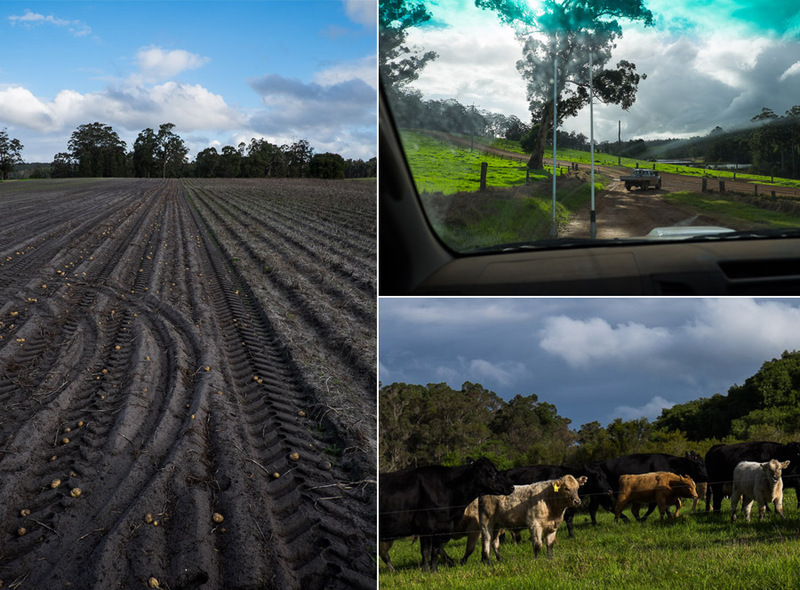 Stellar Violets operates a farm ute that was converted to 100% electric, the first of its kind in Manjimup. 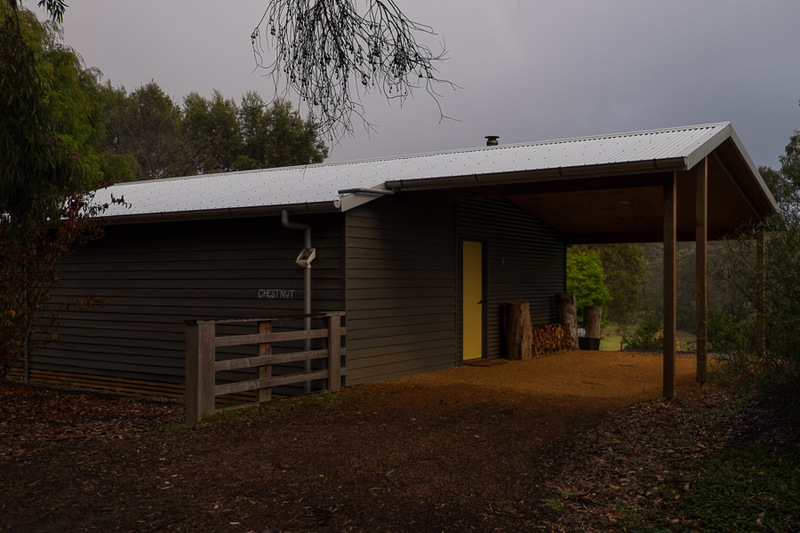 There is a waterless composting toilet in the cottage and a biochar-infused compost system to help enrich the soil, plus many more projects on the go. Over the coming months, Lucinda plans to run workshops and community events at Stellar Violets; in a taste of what’s to come, she recently led a hands-on pickling workshop at the Manjimup Town Hall Kitchen, where participants made their own preserved lemons and pickled vegetables. Standing out against the surrounding farmland and organic orchards are two 20 metre-long vintage train carriages. Made in South Africa in the 1960s, they were listed for sale by the Hotham Valley Tourist Railway and snapped up by Lucinda. They will provide unique, creative spaces for hosting workshops and events and Stellar Violets’ Life Library, where visitors will be able to access books and audio visual materials on various topics related to life and living well. A special feature of the library will be the stories from elders of the local community, sharing their traditions, skills and knowledge, recorded through another Stellar Violets’ project called Life Stories. We left with gifts of Lucinda’s country generosity: a horseradish, fresh out of the earth; a branch of bay leaves; a bag of sapphire potatoes (a Tasmanian variety grown by Lucinda that’s purple on the outside and inside); and three cobs of heirloom glass gem corn, which Jac plans to use for seed. If you know me well, you’ll know that I’m not a gardener or much of a greenie, and I’ve no doubt a movie called Cyn’s Adventures on a Farm would be comedy gold. But I can appreciate a self-sufficient, down to earth way of life and everything that Lucinda is working towards in Stellar Violets. Although the arts and cultural centre is not quite ready to open its doors to the public, Stellar Violets already has a vibrant presence, driven by Lucinda’s extraordinary energy. I’m looking forward to seeing what develops, and visiting again in future. Get the latest updates on Stellar Violets from Lucinda on Facebook. Read more about Stellar Violets’ various projects at the Stellar Violets website. 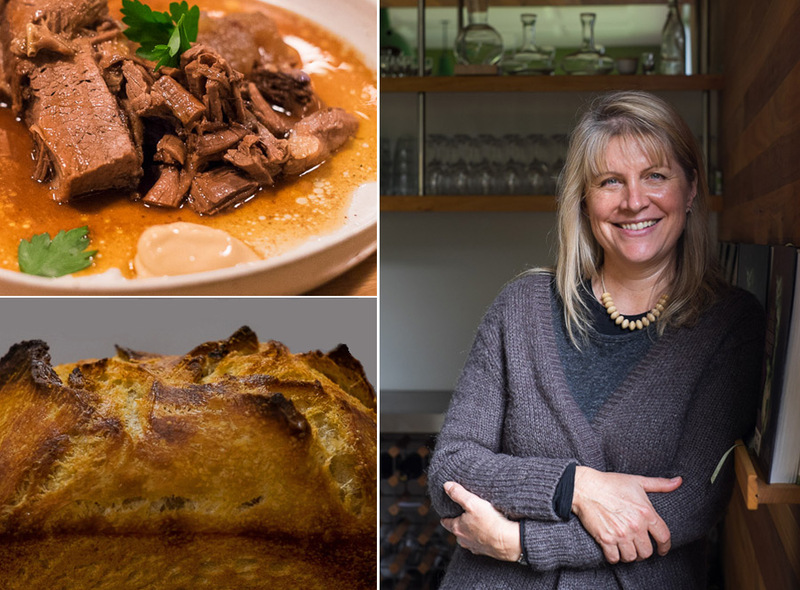 Lucinda told us about Stellar Violets’ first pop-up event on 26 June as part of this year’s Truffle Kerfuffle festival – a Truffle Degustation lunch with Fervor Food. I’ve been to a couple of Fervor dining events – a collaboration with Stellar Violets should be pretty awesome. The main towns of the Southern Forests region are Manjimup, Pemberton, , Northcliffe and Walpole. On this weekend, we spent most our time in Pemberton and Manjimup (around 30 minutes’ apart, by car). 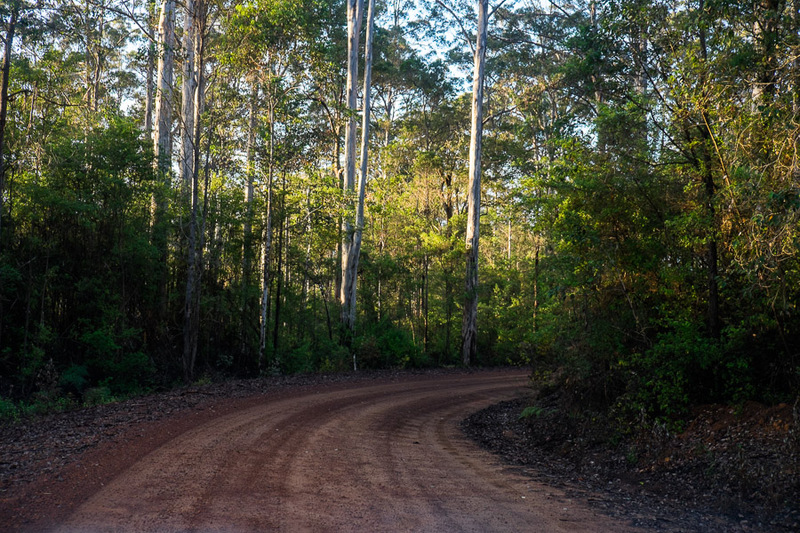 Manjimup is the first Southern Forests town you’ll encounter if driving south, 304 km from Perth. 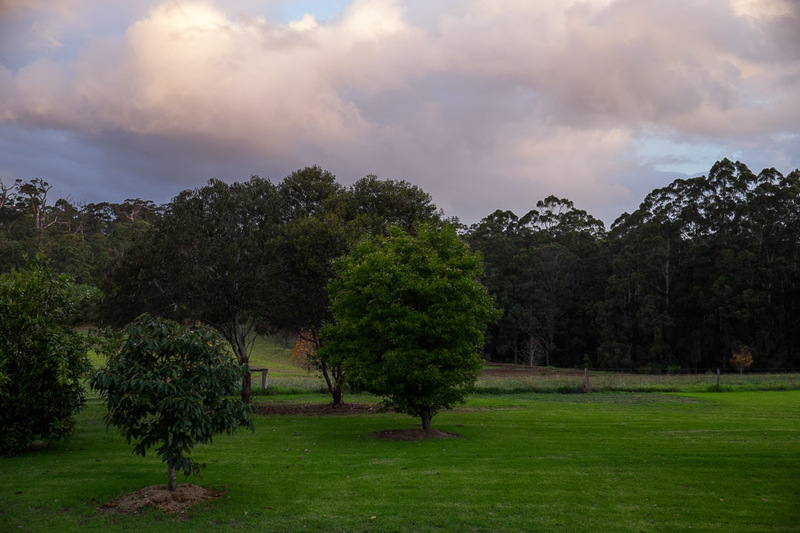 If you’re addicted to your mobile phone and social media, be warned – mobile coverage in the region can be patchy once you get further away from the town centres, especially once you’re surrounded by the towering trees after which the Southern Forests region is named. 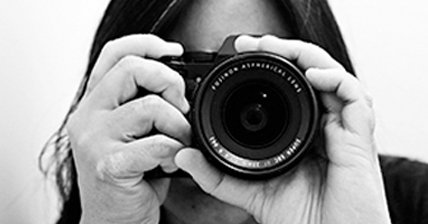 But don’t let that put you off – if I can survive (and have a brilliant time) so can you! It really is a beautiful part of the world and well worth visiting. But definitely don’t rely on Google maps when driving to local attractions, trust me – you’ll be glad to have a paper map. You can pick up free maps from the visitor centres in each of the main Southern Forests towns. This was our third visit to the region; we were already big fans of the Southern Forests before this trip. We learned a lot this time around, met some truly remarkable people and returned to our suburban Perth life with an even deeper appreciation for the passion, innovation and dedication of our growers and producers. We’ll keep eating Southern Forests food and drinking Southern Forests wine and look forward to returning to the region for more adventures. Our visit to the Southern Forests region was hosted by Genuinely Southern Forests. The farm tours and Pemberton Discovery Tours Progressive Lunch were part of Unearthed Pemberton, from 1 to 15 May 2016. This was the second year of the festival. Truffle Kerfuffle is on in Manjimup from 24 to 25 June 2016. This year’s Manjimup Cherry Harmony Festival will be held on 10 December 2016. Watch (or read the transcript of) ABC program Landline’s recent episode – Southern Forests: Regional branding. I mentioned Fonty’s Pool earlier – I took this photo at Fonty’s Pool on our visit to Manjimup in 2012. It really is a gorgeous place and is the venue for Truffle Kerfuffle’s Festival Village.